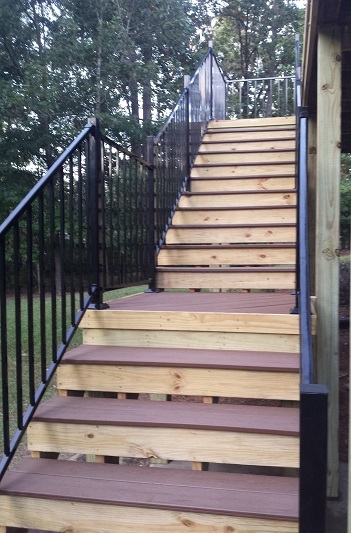 Here at Archadeck of Central Georgia, we have seen our fair share of less-than-professional deck installations. We have seen everything from decks with little or no thought put into the functionality of the design, to decks that were built using incorrect or subpar materials that have become a safety hazard — you name it, we have seen it and fixed it! Westchester Hills deck before we began the redecking project. Our recent redecking project in the Macon neighborhood, Westchester Hills, serves as an example of incorrect installation paired with a cumbersome design. 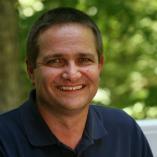 When the homeowners originally purchased the home in the early 2000’s, they had a deck installed when they moved in. 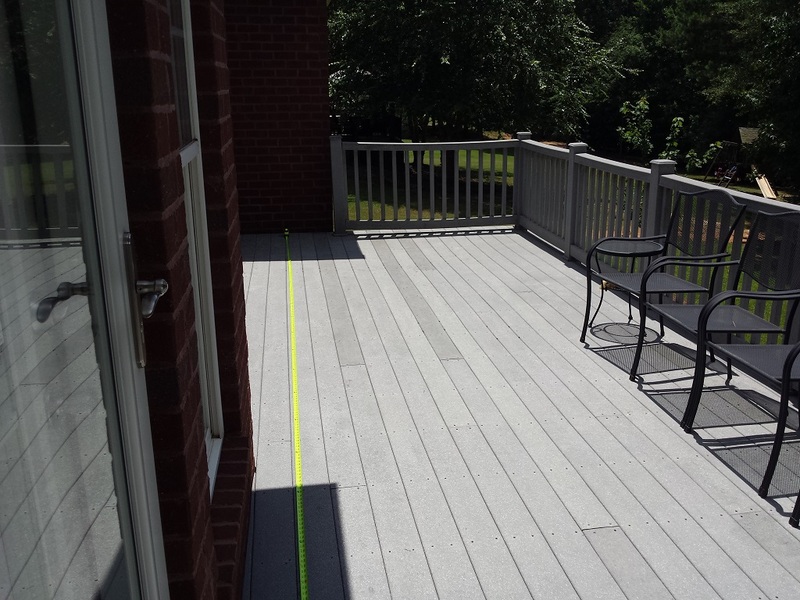 They decided they wanted a low-maintenance deck so they chose to have their new deck built with Trex composite decking. After some time had passed, they noticed that the exterior of the decking boards had begun to mildew. The mildew was an issue that arose from the incorrect spacing and gapping of the decking boards during the initial installation of the deck. The boards were installed with little to no space between them which caused them to mildew. Thus, the homeowner had to use bleach in order to remove the mildew which then compromised the integrity of the boards themselves. Once the bleach began to break down the components of the decking boards, they began to flake and degrade. The use of bleach also degraded the deck railing and skirting as well. Archadeck of Central Georgia met with the homeowners to inspect the deck and discuss the possibility of a redeck or a new deck. Since many of the original joists were in good shape, we were able to redeck after strengthening the deck’s substructure. One notable element we found during the project was the original deck was secured using zinc bolts rather than galvanized bolts, these were rusted and decayed making the deck a safety hazard. Along with replacing the bolts and strengthening the substructure we also did a great deal more! We fixed the design of the deck to ensure it landed on the concrete pad below and redecked the entire field with TimberTech Terrain decking in brown oak. 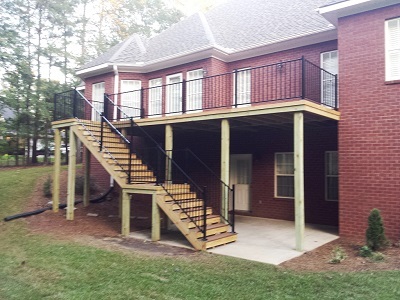 The new railing we installed is 2" Fortress iron posts alongside Fortress iron panels. 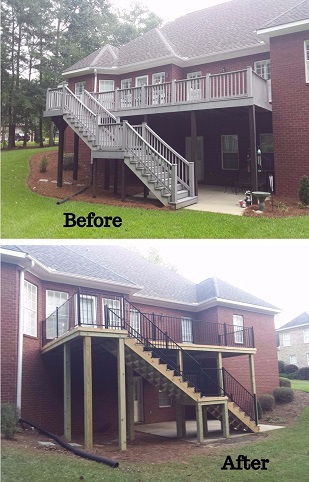 The new deck is professionally built and solid from the ground up promising these Macon homeowners plenty of worry-free enjoyment for years to come!